Cheshire, Massachusetts: Melanie Mowinski, 2016. Edition of 10. 4.75 x 7"; 10 pages including covers. Materials: printed papers; dyed tyvek; facsimiles of watercolor monotypes; souvenir papers from Venice. Processes: letterpress printing, hand-painting, paper cutting. Numbered. Melanie Mowinski: "Parallel Pathways reveals my discovery that there was often more than one way to get somewhere, if you were willing to be present to being lost and unattached to time. Parallel to this discovery, I noticed that somewhere in the past centuries, the Madonna has become unnoticed, a piece of art history for many and a point of prayer for few. This juxtaposition between time, journey, art history and prayer captivated my attention through the form of this storage book holding elements of the journey of Venice. "This book uses the storage book structure designed by Hedi Kyle and includes ephemera from Venice, ranging from vaporetto tickets to prayer cards from Santa Maria della Salute. 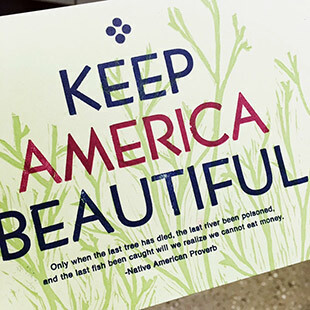 It includes laser cut-outs thanks to Free Fall laser, letterpress text, and hand-painted gold accents." 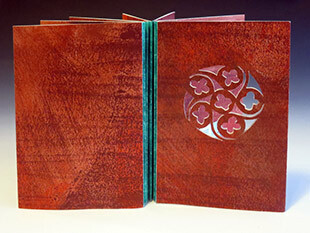 5.5 x 6"; 8 double-page openings. Star carousel structure. Letterpress printed in Bembo, a typeface based on a 15th-century design cut by Francesco Griffo for Aldus Manutius. Materials: natural pigment watercolors, gesso, graphite, ink, acrylic paint, and paper. The middle layer is hand-painted with natural pigment watercolors and gesso; with graphite, ink and acrylic marks. The back layer is letterpress printed hand-cut Flexi-Cut. Bound in paper over boards. Magnet closure for opening carousel. Signed and numbered by the artist. In slipcase. Melanie Mowinski: "Wayfinding Star documents departure from latitude 42.562/longitude 73.1629 (Cheshire, MA where I live) to latitude 45.4343 / longitude 12.3388 (Venice, Italy where I spent winter 2016). Each line in the middle layer represents latitude and longitude lines, demonstrating the closeness in latitude but distance in longitude. The text on the front layer recounts experiences navigating in Venice as I lost and found my way, always listening for the toll of church bells, the back layer of the book. The eight-point star references the compass rose and the many geometrical patterns centered on the number eight encountered throughout Venice." 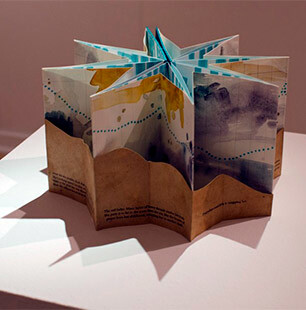 This book is part of larger body of work called Wayfinding. Guide to Viewing: Dots represent thoughts, tasks, the barrage of media and other repetitive parts of life. Dotted Lines are pathways. Most of them are actual runs or walks that the artist made in the various places she visited in the past six months (roughly the first half of 2018) as tracked on her Nike Running App. Circles represent places. Size can be the actual size or how long she spent there. Penciled lines are latitude or longitude lines. Birds are the artist and you and everyone known by her and you. Cheshire, Massachusetts: Melanie Mowinski, 2017. 50 letterpress-printed cards. Each card printed with vintage letterpress type, cuts, and/or other printing matrixes like linoleum blocks and the occasional polymer plate. Housed in custom enclosure. www.mcla.edu, Jan. 18, 2018: "Every week since Inauguration Day, and through the end of 2017, Melanie Mowinski, an associate professor of visual arts at MCLA [Massachusetts College of Liberal Arts], printed a new letterpress card in a limited edition of 100 using vintage letterpress type, cuts, and other printing matrixes. After a new card was completed each week, copies were sent out via mail and e-mail, and were posted online. 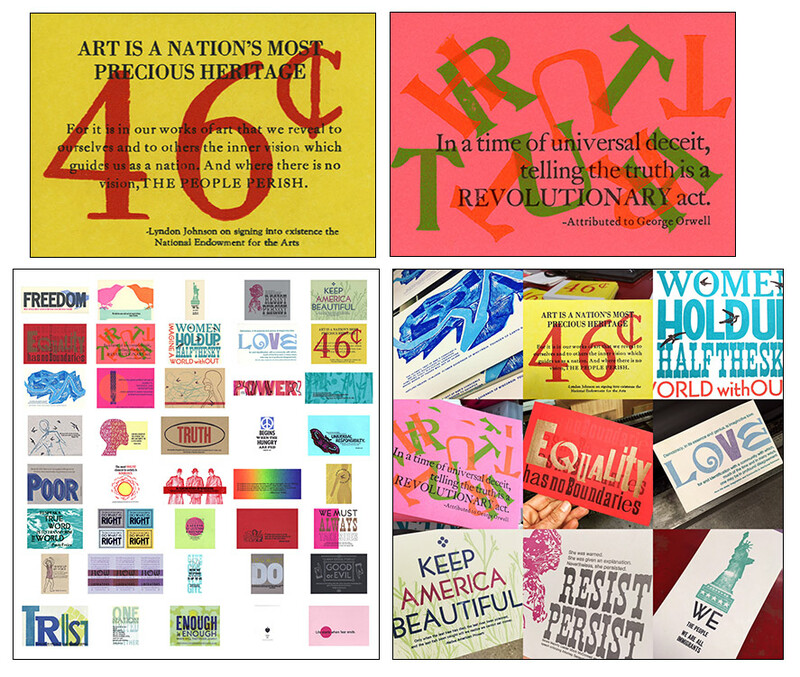 In addition, 15 to 20 cards were sent to key players in Washington, D.C.
"'Mowinski’s 50 Card Project makes both a political and artistic statement through her use of positive affirmations regarding our current politics, combined with beautiful, thought-provoking imagery,' according to Arthur De Bow, MCLA Gallery 51 curator. “'Mantras such as ‘Equality has no Boundaries’ can help reframe someone’s day. Positive statements can be used to bring change on many fronts. Positive affirmations, when practiced deliberately and regularly, can reinforce a chemical pathway in the brain, making the connection between two neurons stronger, and therefore more likely to conduct the same message again,' De Bow said." Mowinski: "The 50 Card Project book celebrates a year of letterpress cards printed every week from Inauguration Day to the end of 2017. This project was directly inspired by the statement liberty and justice for all." Cheshire, Massachusetts: Melanie Mowinski, 2008. Edition of 29. 5.5. x 6.75", 20 unnumbered pages. Flag book structure. Paper collages Pressure printed on Mohawk Superfine paper. Typeface: Didot. Printed with an Epson 2880 Inkjet printer. 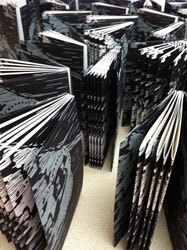 Laid in paper portfolio with hardcovers. Denali National Park & Preserve (Alaska) covers more than 6 million acres and features North America's highest mountain, 20,320-foot tall Mount McKinley. The Park was designated an international biosphere reserve in 1976. East Fork: Into Denali originated from drawings, walks, and writings while Mowinski was an artist-in-residence in Denali National Park and Preserve in June 2008. The illustrations are shades of green with minimal text. Cheshire, Massachusetts: Melanie Mowinski, 2008. Edition of 40. 4 x 6"; 10 pages. Printed on blue paper from French Paper Company. Relief printed images. Bound in a variation of a storage book structure. Housed in black paper with envelope fold. Slot and slip closure. Melanie Mowinski: "When I was in graduate school in Philadelphia, my work became completely centered on trees and nature. 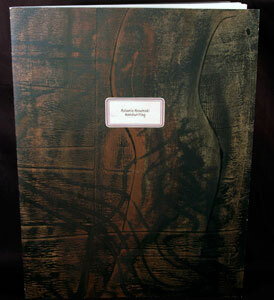 I created tree rubbings, books about trees, paintings focused on rocks, and other things. I read Thoreau and Emerson and dreamed about the woods. "… only when I returned to living in the woods did I realize that much of what that work was about was NOT having access to the woods and nature. As I was realizing this, I was reading Emerson’s Nature essay. I played around with the text and simplified it down to 30 words, few enough to memorize. I could carry the sentiment with me wherever I went. When I am in the woods I often repeat this as my mantra. 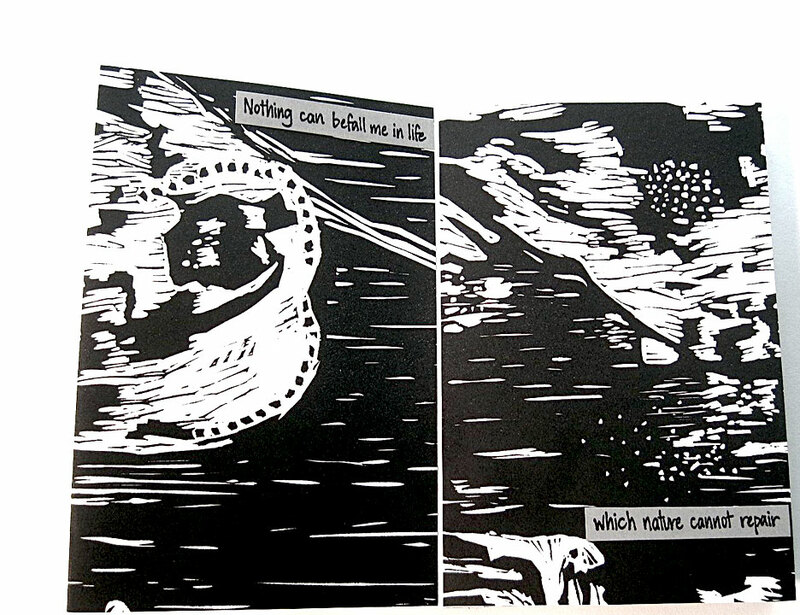 "I decided to create a small little book of this mantra, paired down from the essay. The words are printed on a blue French paper from a polymer plate of my handwriting. The pages, including the covers, are relief printed images – the same image repeated over and over and transformed by the different lines of text. The original one-of-a-kind mock-up was from stone lithograph prints made in grad school. The structure is derived from Hedi Kyle’s Storage Book Structure: folded pages mounted on a very thin tyvek accordion with a non-adhesive folded cover." Cheshire, Massachusetts: Melanie Mowinski, 2005. Edition of 29. 11 x 14.5"; 16 unnumbered pages. Printed on an Epson Stylus Pro 4000. 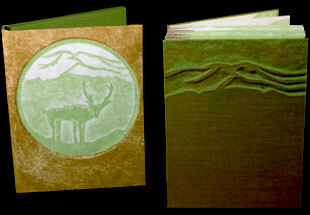 Bound in illustrated wraps with paper title on front cover. 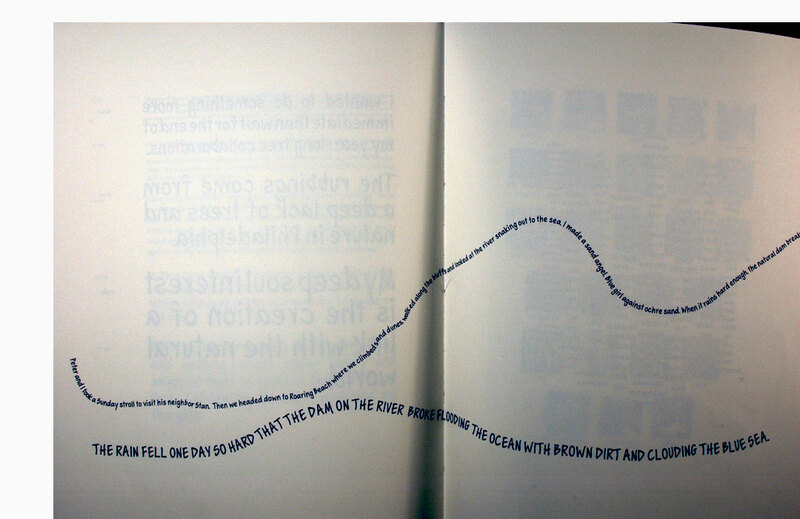 Colophon: "Melanie Handwriting evolved out of the free writing of the artist. Since she was a small child, lettering, calligraphy and writing captivated her. She practiced her cursive and printing, inventing different styles to fit a particular time of life. "This font highlights her current style of writing utilized in her travel journals and field guides. It was created by extracting samples from previously written texts that she scanned and traced in her computer before finalizing it into Melanie Handwriting." Why Owl, Why? What do you want me to learn? Cheshire, Massachusetts: Melanie Mowinski, 2013. Edition of 10. 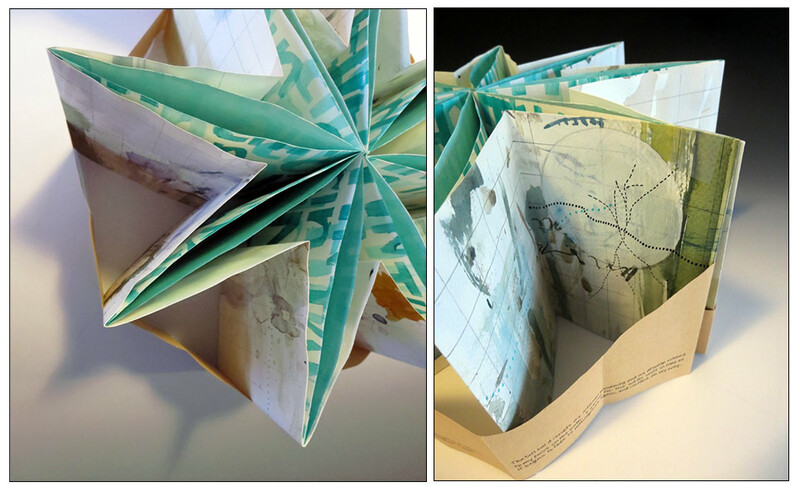 7 x 5" tunnel book structure. Four-color reduction linoleum print. Signed and numbered by the artist. Melanie Mowinski: "Twice, within a span of ten days, in the exact same spot, a barn owl or a barred owl nearly flew into the windscreen of my car on my drive home from work. Both times I swear I could see its eyes, it was that close. I keep replaying the moments in my mind, along with folklore about owls, trying to find the meaning in this encounter. "Some cultures fear the owl. It is silent. It deceives its prey. When its razor sharp beak and talons strike, its victim knows. 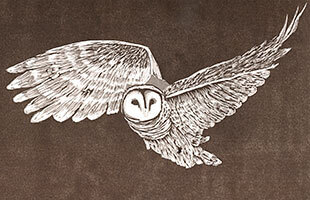 "Other cultures see the owl as a symbol of wisdom. It can see what others cannot not. It knows truth, knows when others are deceived, and is not easily deceived itself. "Silence. Wisdom. Deception. What, owl, do you want me to learn from this meeting of ours? Am I missing something in my silent observation of my life? What message do you bring me? "I have no answer. But I continue to listen to all you and the earth offers me."